TotalAV offers a free antivirus and security suite including full system virus and security scans that are robustuser-friendly, enabling you to protect your computer and mobile devices from malware, adware and spyware. 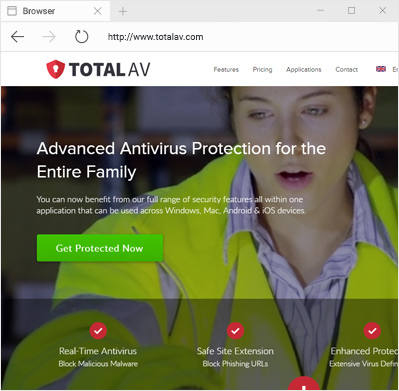 We are wowed by Total AV, and have named it the top antivirus provider for 2018. TotalAV comes out on top in terms of price and functionality. One of TotalAV’s key features is its malware protection. This feature is user-friendly because it manages itself. Installation consists of a simple click and completing a short form. Starting scans is also simple, and full system and real time scans will work seamlessly in the background to monitor for threats and oversee the general health of your PC on a continual and consistent basis. Users can quickly understand any issues found on your computer with results that are displayed clearly and succinctly, with an option provided to allow you to immediately resolve the issue. Experian is integrated into TotalAV to protect your identity both online and off. Complementing an excellent product, TotalAV’s customer service is similarly high-quality, with the option of using online chat, email, and telephone for no extra cost. TotalAV’s support professionals will quickly address any technical or billing issues Customers also have the option to upgrade to Priority Support for even more immediate responses to inquires.